Please keep up with all of my old Graphic Novel Reviews here as I quest for 365 in 365 days! Or search #GN365 on Twitter. Please forgive the brevity of tonight’s post. I caught a terrible cold last night, and it’s taking all of my energy to get this out. 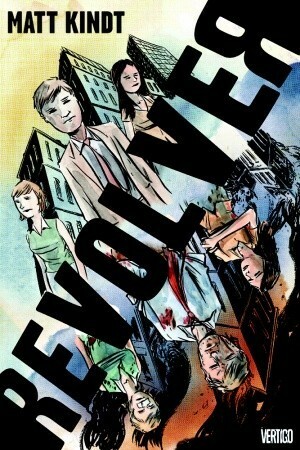 Revolver, by Matt Kindt, fits perfectly into our cerebral theme this week. The book focuses on a man named Sam that seemingly lives between two worlds: the normal, everyday, mundane…and a world plagued by nuclear war, natural disasters, and chaos. At 11:11, Sam flips between worlds. He remembers everything from each world, but he does not take away any physical alterations. Sam must make some difficult decisions as he navigates the two worlds and tries to figure out who or what is causing the destruction. For the most part, Sam is joined by his boss and girlfriend, and the way Kindt plays with the characterization between worlds is fun to watch. However, only Sam flips between the two worlds…at least as far as the reader knows from the first two acts of the book. Imagine if you spent half of your day in a Walking Dead type world and the other half in your mundane “my job is boring” world. This juxtaposition plays well for the character of Sam. The art and panel layouts are fine. The big winner of this title is the story…and the running news banner at the bottom of each page that eloquently incorporates the actual page number.